U.S. Senator Mark Kirk spoke about his career path to senator and shared his perspective on foreign affairs, medicinal marijuana and other various relevant topics to Triton College students during the institution’s Executive Series on October 30th. Facilitated by Triton’s School of Business, the ongoing series brings inspiring guest speakers on campus to share their educational and career experiences to encourage Triton’s students to think about academic and career paths that can help prepare them to compete in today’s job market. He also spoke on a current bill he is working on that would allow parents to save money in a tax-deferred savings retirement account for their children as soon as they are born. In January 2012, Senator Kirk suffered an ischemic stroke and underwent surgeries at Northwestern Memorial Hospital to relieve swelling in his brain. After nearly a year of intensive recovery and rehabilitation, Senator Kirk triumphantly returned to work by climbing the 45 steps of the U.S. Capitol on Jan. 3, 2013. Senator Kirk currently serves on four Senate Committees: 1) Appropriations, 2) Banking, 3) HELP (Health, Education, Labor & Pensions), and 4) Aging. Senator Kirk is the Ranking Republican on the Appropriations Subcommittee for Military Construction and Veterans Affairs. For more information on Senator Kirk, visit www.kirk.senate.gov. U.S. 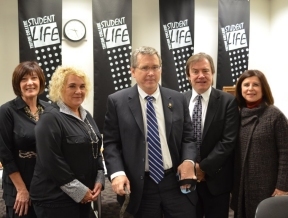 Senator Mark Kirk (center) stands with (from left to right) Triton College Board of Trustees Diane Viverito and Donna Peluso, Board Chairman Mark Stephens and President Dr. Patricia Granados.